Sri Lanka’s largest listed conglomerate John Keells Holdings Plc on Tuesday won the coveted ‘Cyril Gardiner Memorial Trophy’ Gold Award for Overall Excellence in Annual Financial Reporting at the grand finale of the 52 Annual Report Awards competition organised by the Institute of Chartered Accountants of Sri Lanka (CA Sri Lanka). Diesel & Motor Engineering Plc won the silver award for overall excellence in annual financial reporting, while the Commercial Bank of Ceylon Plc won the bronze award. The companies were honoured at a gala ceremony held on 6 December 2016, under the patronage of Ravi Karunanayake and the country’s corporate glitterati including business leaders, chairmen, CEOs, Managing Directors, CFOs and high-ranking government officials. The organisations were honoured sector-wise under several award categories comprising gold, silver and bronze as well as compliance awards. John Keells Holdings Plc won the Management Commentary Gold Award, while Diesel & Motor Engineering Plc won the silver and Hayleys Plc won the bronze. The gold award for the Corporate Social Responsibility Reporting Award was bagged by Hayleys Plc while Commercial Bank of Ceylon Plc won the silver and LB Finance Plc won the bronze. People’s Leasing & Finance Plc won the gold in the Corporate Governance Disclosure Award, while Commercial Bank of Ceylon Plc won the silver with bronze won by Sampath Bank Plc. 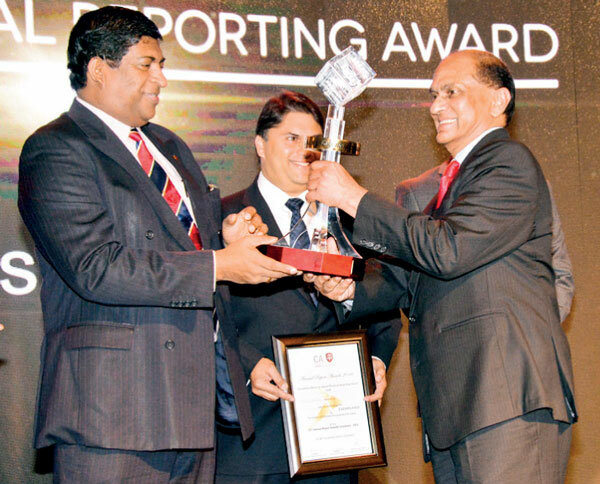 Diesel & Motor Engineering Plc won the gold award in the Integrated Reporting Award category, while John Keells Holdings Plc won the silver and Commercial Bank of Ceylon Plc won the bronze. The gold award for best disclosure on capital management in integrated reporting was won by LB Finance Plc, followed by Commercial Bank winning the silver and People’s Leasing & Finance Plc winning the bronze in the same category. Diesel & Motor Engineering Plc won the gold award for best disclosure on a business model in integrated reporting, while Sampath Bank Plc won the silver and John Keells Holdings won the bronze. In the sector awards, Lanka Clear Ltd. won the gold in the Small and Medium Sized Entities sector, while Laugfs Gas Plc won the gold award in the Power and Energy sector. MTD Walkers Plc won the gold in the Construction Companies sector, while Seylan Development Plc won the gold in the Land & Property companies sector. The Ceylon Chamber of Commerce won gold under Not for Profit Organisations, including the Non-Governmental Organisations sector, while Keells Food Products Plc won the gold in the Food & Beverages companies sector. Softlogic Life Insurance Plc won the gold in the Insurance Category. Both CIC Holdings Plc and Alumex Plc won gold awards in the Manufacturing Companies sector, while the gold for the Plantations Companies sector was won by Talawakelle Tea Estates. Aitken Spence Hotel Holdings Plc won gold in the Hotel Companies sector, while Singer Sri Lanka Plc won gold in the Trading Companies sector. People’s Leasing & Finance Plc won the gold in the Finance Companies & Leasing Companies sector, while the National School of Business Management won the gold award under the State Corporations & Statutory Boards category. United Motors Lanka Plc won the gold under the Motor Companies category, while Sri Lanka Telecom Plc won gold in the Telecommunications Sector. Hayleys Advantis Ltd. won gold in the Service Organisations sector, while Nawaloka Hospitals Plc won the gold award in the Healthcare Institutions sector. EAP Broadcasting Company Ltd. won the gold in the Media and Entertainment category. National Savings Bank won the Albert A. Page Memorial Trophy under the Financial Institutions sector, while Commercial Bank of Ceylon Plc won the Edmand J Cooray Memorial Trophy in the Banking Institutions sector. Diesel & Motor Engineering Plc won the gold in the Diversified Holdings (Groups up to 10 Subsidiaries) category and John Keells Holdings Plc won the Lal Jayasundara Memorial Trophy in the Diversified Holdings (Groups above 10 Subsidiaries) category. Speaking at the event, CA Sri Lanka President Lasantha Wickremasinghe said that at a time when Sri Lanka was progressing towards enhanced economic and infrastructure development there was a stronger need to ensure that transparency, accountability and good governance was further strengthened and maintained. He highlighted that all organisations, be it a small-time non-profit organisation or a large-scale conglomerate, have an important role to play in Sri Lanka’s forward journey. “As much as a corporate contributes towards the growth of a country it should also ensure that it promotes transparency and accountability along with good governance within an organisation, which will be reflected at the national level in the long term,” he said. Wickremesinghe said that as a professional organisation, CA Sri Lanka would continue to take every effort necessary to support the country’s vibrant corporate sector, helping them strengthen their standing while being an important contributor in Sri Lanka’s journey forward. Annual Report Awards Committee Chairman Sanjaya Bandara said that the competition, which is in its 52nd year, has become a benchmark which has helped organisations gain renewed recognition and reputation for their enhanced financial reporting standards. “Organisations need to incorporate vision, swiftness, strength and power to progress and the Annual Report Awards competition has given organisations in Sri Lanka this important edge to help them progress and strengthen their position despite the many challenges and complexities faced in the current context,” he added.